Mom and Dad can fly! The chicks are at the toddler stage. The larger chicks, especially, can stand on their legs and take wobbly steps. They are starting to stretch their wings and there are hints of feathers along the edge of the wing. They also do not stay in one big fluffy heap all the time and are often dispersed to the corners of the box, where one or more may be out of view of the camera. On May 22, the adult falcons started calling to the chicks as they flew by the nest box, showing off their flying skills. At fisrt the chicks did not pay much attention. They actually slept through one whole demonstration. But, they have started to totter to the edge and pay more attention to what is outside of the box. 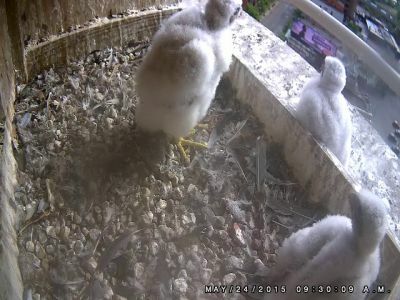 At about 9:30 AM on May 24, the third chick stepped out onto the ledge after being fed. Several alert falcons watchers notified yours truly that one of the chicks was missing. I reviewed the video feed and watched the chick on the ledge for, what seemed to be an unbearably long, 20 minutes or so before he stepped back into the box. One of the chicks was in the corner under the camera, so only three chcks were visible for awhile, which concerned viewers. Thankfully, all chicks are currently accounted for.